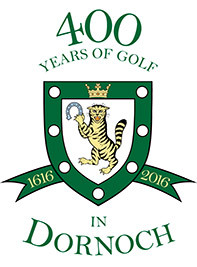 In 2016 Dornoch celebrated 400 years of golf by holding different events throughout the year. The events highlighted the aspects that make Dornoch, the club, the town and the community an international destination for visitors. Supported by Royal Dornoch, the community of Dornoch, local businesses, the local schools, community groups and sports clubs, the year was filled with concerts, exhibitiions and events that celebrated the culture and sporting history of the area. The 400 years of golf celebration teed off on the 2nd January 2016 with the Captain of Royal Dornoch 'driving in' using a special hand crafted hickory club and feathery ball. It was rounded off with visits from the Royal Clubs around the world in September and the club Captain sank the final putt on the 18th green at the Captains weekend in October. During the interim months there was something for everyone: visitors, locals and golfers were able to attend music, drama, and art exhibitions at Royal Dornoch Golf Club and throughout the town - everything from a themed street party to a gala dinner.